1. Practical examinations shall be conducted in two spells, i.e., 1st spell from 07-08-2018 to 14-08-2018 and 2nd spell from 16-08-2018 to 21-08-2018. 2. The time for each practical examination is 30 minutes. 3. Principal, Govt. DIET shall conduct a meeting with Principals and Faculty members of all private D.Ed., colleges to apprise about the conduct of practical examination. 4. Principal Govt. DIET concerned shall make the total colleges in their district assembly constitution wise and arrange them spell wise for conduct of practical examinations. 5. Govt. DIETs / Private colleges where the intake capacity is 100 candidates, the Principals of Govt. DIETs are required to appoint one more external examiner for each subject from the private colleges where such subject teacher educator are available. 6. Each college shall be allotted to 1 Primary school/upper primary school. 7. Same batch of trainees will continue in the same school which is allotted for them for final practical examinations till completion. 8. Internal Examiner will be the faculty member of the same institution and External Examiner will be allotted from other college. 9. In case any internal or external examiner does not report, the principal of the DIET of the respective district shall make alternative arrangement. 10. The final lesson average marks awarded shall be furnished by the external examiner to the Principal Govt. DIET concerned in a sealed cover denoting college code and name, subject and number of candidates immediately after completion of practical examinations. The Principal Govt. DIETs shall receive the sealed covers from the external examiners concerned and submit them with a consolidated list to the Director of Government Examinations, A.P., Amaravati. 11. 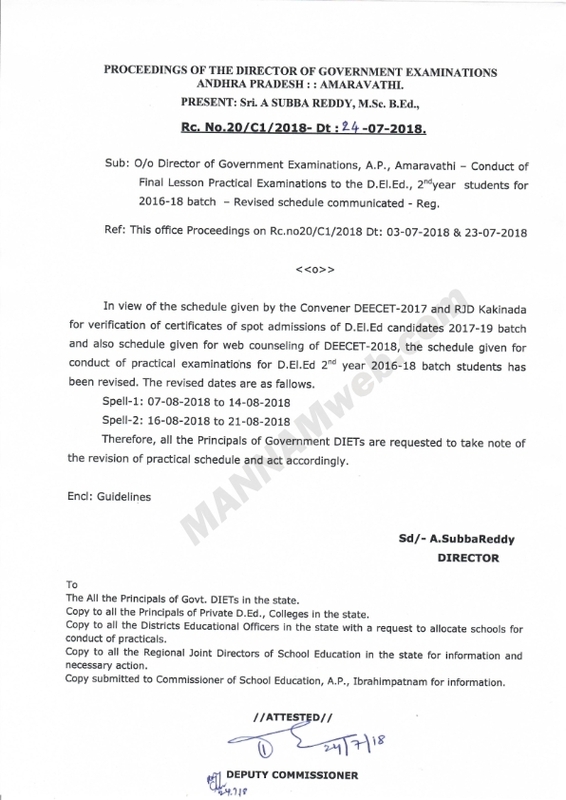 Principal, DIET shall record the attendance of the faculty members of the college and copy of attendance shall submit to the Director of Government Examinations. 12. The final practicals should be conducted in English, EVS and Optional Subject @ 2 lessons in each subject with instruction to teach one lesson in class I or II and one lesson in class III or IV or V. Hence teacher trainee has to complete 4 final lessons. 13. In this year the external examination are in English, EVS and Optional Subjects only. But the concerned teacher educator has to assess his students performance in Arts, cultural education, Yoga, Physical and Health education. 15. If duration of spell wise given days are not sufficient for practical examinations the Principal Govt. DIET can extend one or two days.